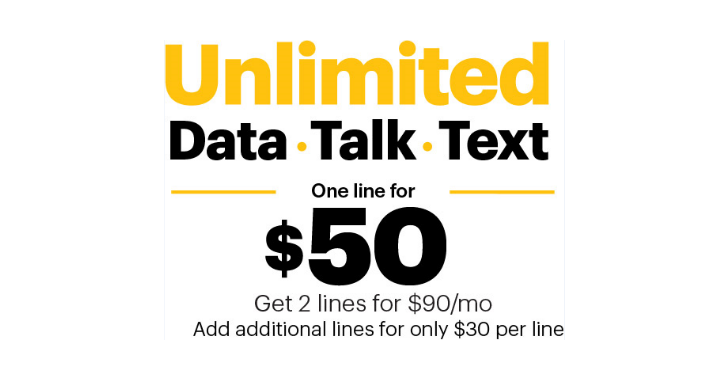 In the words of Sprint, it's "doubling down" on unlimited. However much everyone now hates that phrase, this is probably good news. Unlimited data, calls, and texts are scarce nowadays, whereas Sprint is charging just $50 a month (for comparison, the 5GB data deal on Verizon is also $50 per month). Pretty good. The sad news is this deal is only for new customers. Sorry, people already on Sprint - your time will come. It's also only live for the next four days only - ending on January 30 - so get switching to Sprint if you've been shopping around for unlimited data. Adding a second line takes the total up to $90 for both, and $30 each for any more than that. All in all, sounds like a good deal. Head over to Sprint's site to take a further look, but remember, you've only got four days on this, so get out those spreadsheets and checkbooks quickly. As noted in the PR below, the deal is only temporary - your savings expire (i.e., your bill will go up) on March 31st, 2018, after which the price is $60 a month for individual lines. All of us at Sprint couldn’t disagree more, so starting today, we are doubling down on Unlimited. For four days only, new customers to Sprint get Unlimited Data, Talk and Text for just $50 per month*. Add a second line and pay just $90 per month for both. Add additional lines for just $30 per line. Enjoy unlimited mobile optimized streaming videos, gaming and music and unlimited 4G LTE data for most everything else while on the Sprint Network. That’s worry-free wireless for at least $5 less than Verizon’s new 5GB for $55 plan. We don’t underestimate the value of unlimited data and neither should you – or Verizon. I find it pretty ballsy for Verizon to tell me what I need or don’t need. We prefer to listen to our customers (not tell them what they need) and, overwhelmingly, Sprint customers are choosing our powerful unlimited rate plans to live their lives without limits. 5GB isn’t really much data. I can eat up 5GB of data watching just seven episodes of any of my Netflix favorite, House of Cards. With HD viewing, Netflix uses as much as 3GB per hour! 5GB would give me just about two hours a day per month to stream my favorite songs on TIDAL. That isn’t much, especially when I am traveling. And YouTube? That could cost me close to 1.5GB in an hour. I would use up my 5GB allotment in just under three and a half hours. Are your eyes glazing over trying to calculate how much data you use every month? Do you have ANY idea how much data you – or your teenagers – use each month? Do you want to know? Or would you rather live worry-free using your wireless device to its potential? At Sprint, we don’t TELL our customers how much data they need. We give them a choice: rate plans that provide data buckets or the simplicity of unlimited – both at great values. Most current Sprint customers are taking advantage of unlimited data plans. They enjoy talking, texting, tweeting, streaming, snapping, gaming… whatever they want! Welcome to 2017, Verizon. No one wants to watch a data meter and change their habits to meet your plan restrictions. Mobile video data traffic is doubling every 18 months, indicating its importance to wireless consumers. Wireless customers are using their smartphones more than ever, especially as we let go of traditional landline phones. Almost half of all U.S. households rely fully on mobile phones and have cancelled their landlines. Wireless-only households exceeded 48 percent at the end of the year, up from 8 percent just 10 years ago. *After March 31, 2018, pay $60/mo. Mobile optimized: video streams at up to 480p+ resolution, music at up to 500kbps, streaming gaming at up to 2Mbps. Data deprioritization applies during times of congestion. Requires ebill. Pricing shown with $5/mo./line AutoPay discount applied within two invoices. Requires new account activation. Other monthly charges apply. ** Claim based on Sprint’s analysis of latest Nielsen drive test data for average network reliability (voice & data) in top 106 markets.